1) Tony Moly Tomatox Magic Massage Pack: An intensely hydrating mask that comes in a super cute tomato-shaped jar. It leaves my skin soft, moisturized and bright, I can really see the difference; furthermore, it smells so good. Highly recommended. 2) Tony Moly Panda's Dream Dual Lip & Cheek: I can only say that I fell in love with the adorable packaging, the main reason why I bought it. But there is more, this sweet panda compact contains a mirror, a matte blush and a lip gloss; it's the perfect product to carry in the purse just for quick touch-ups throughout the day. The shade I picked is Pink Baby. 3) Tangle Teezer Original: An innovative hairbrush that easily detangles with the minimum damage and pain, leaving the hair smooth and shiny. It really works well and is the first hairbrush I truly love and recommend. The colors are very nice and put me in a happy mood every time I use it, on wet or dry hair. Io non posso più fare a meno di quella spazzola... è geniale! Molto belle queste proposte, mi piacciono tantissimo! I have the Tangle Teezer Original as well. It really is so useful after washing your hair. Happy weekend Lilli! Dear Lilli. The packaging of the two Tony Moly products are so cute. 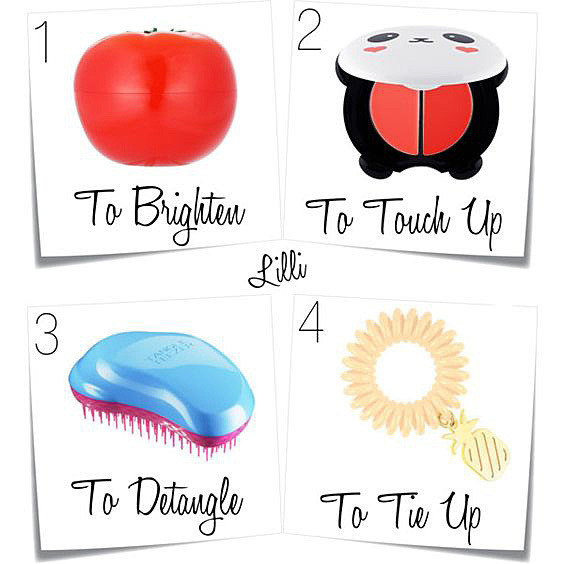 The Tangle teezer is a must have and so practical for the handbag. I have one too. These are wonderful and so compact to carry around. Happy weekend Lilli. You always have the best stuff here. I love all these products Lilli. I love the pineapple tie-up. Enjoy a great start of the new week! woow io adoro quegli elastici però non avevo mai visto la versione con il pendente. la spazzola voglio provarla da tanto anche se non riesco a trovare l'originale , solo delle copie che costano poco e non so se fidarmi. Il panda è dolcissimo, lo voglio pure io! E anche l'elastico, troppo cool! Oh! I have fallen in love with those packaging of panda and tomato, the hair ornament in the shape of pineapple too, great finds Lilli! Happy start of week. Kisses. Vorrei provare il Tangle teezer, me ne hanno parlato in tante molto bene.